As we reflect on 2018, we have realized that we we’re surrounded by strong, dedicated women — women who started their own businesses, women who took risks, women who broke the mold. At Artsy, we’re not only here to help these women build their businesses but also we want to build them up. So, we created Fearless Females. The Fearless Females campaign encourages women business owners, creative entrepreneurs, and mountain-moving women to find their voice and to speak to like-minded, hard-working women. September started with three incredibly talented women who started their own successful businesses. One stood out and won our first Fearless Females title: Elizabeth Melara, a California native and architect who started her own design business. 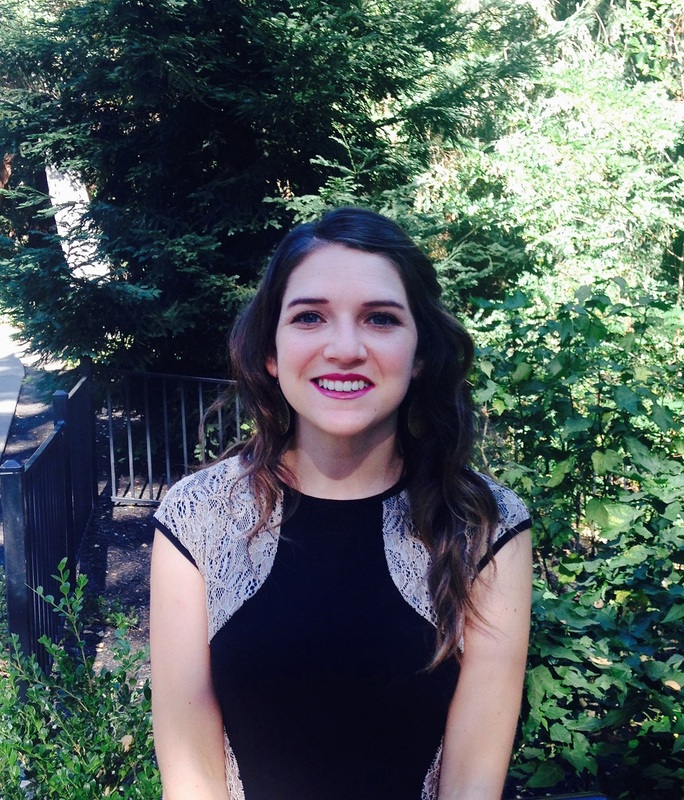 Growing up in Sacramento, California, Elizabeth found her passion for art and drawing at a very young age. As she continued to draw throughout high school, Elizabeth looked for ways in which she could incorporate this skill into her career path. She discovered landscape architecture — a career in which she could marry her artistic skills with her love of plants and outdoor spaces. During her time at California Polytechnic State University, Elizabeth honed her skills by taking courses in drawing and plant biology as well as spending time observing the outdoor spaces she experienced. Elizabeth also spent a lot of time observing spaces, including the many outdoor malls, greenery, rolling hills, and landmarks that California has to offer. After Elizabeth finished her undergraduate degree, she settled in San Francisco where she took a job with a local architecture firm. Elizabeth found herself wanting more than what her desk job had to offer. 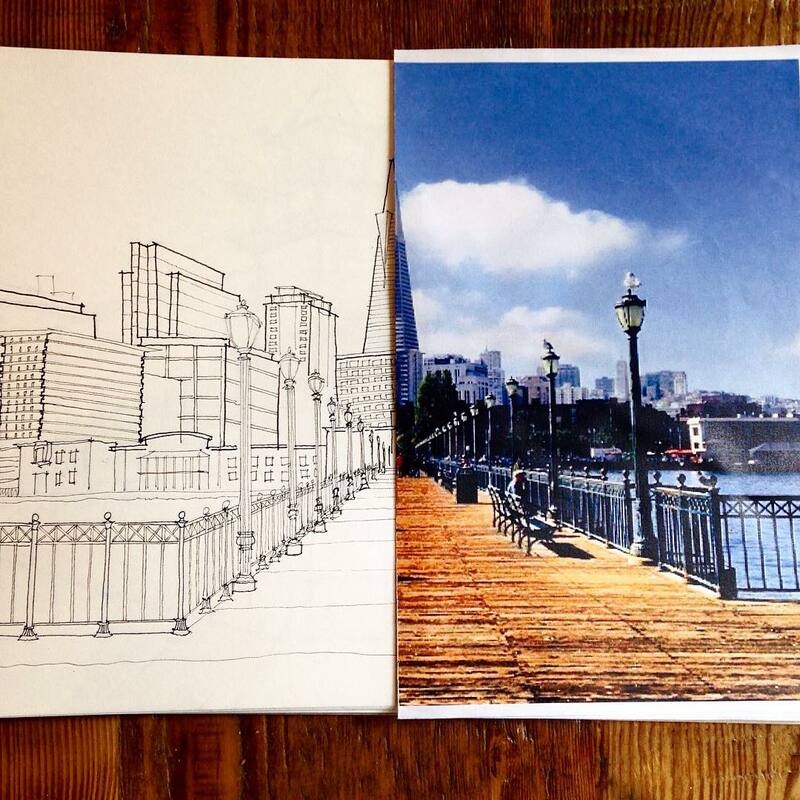 Often during her lunch break, she would sit on a park bench and draw pieces of San Francisco’s skyline. With each passing day, Elizabeth fell more and more in love with the city. 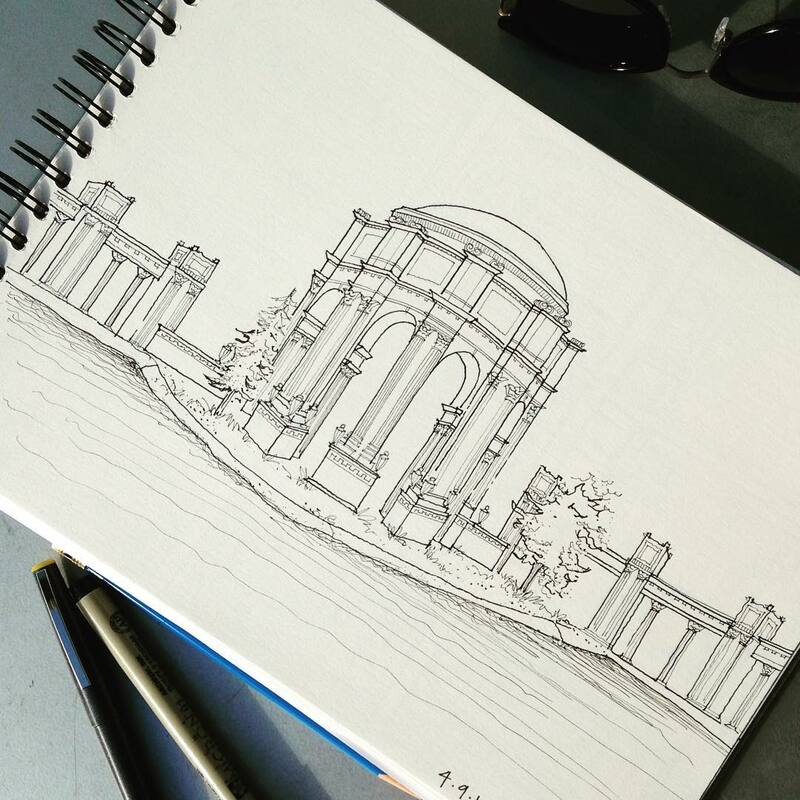 Lunch breaks turned into post-work strolls, in which Elizabeth filled an entire book with technical drawings of San Francisco’s most beautiful landmarks. 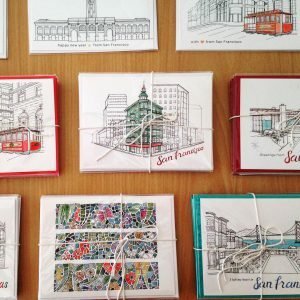 She illustrated each inch of the city from Coit Tower to the Bay Bridge, from Transamerica Pyramid to Levi’s Plaza. Eventually, Elizabeth started using watercolor, her favorite color medium, because it adds a unique, special tone to each piece. At first, it didn’t occur to Elizabeth that she could use both her landscape architecture career and her passion for drawing. With a little help from a friend, Elizabeth was encouraged to take a leap of faith and build a business of her own. She started by networking with friends, creating a supportive social infrastructure, and creating an Etsy shop. The official launch party was nothing more than a few bottles of wine, her closest friends, and a table of custom designed cards printed by Artsy Couture, all gathered in her apartment. Soon, the business evolved into trips around California attending craft shows to display her latest designs and sell packs of custom cards. 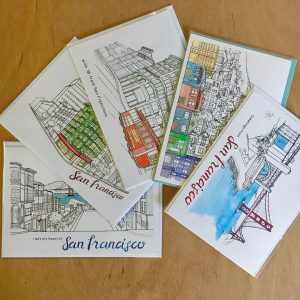 Etsy was also a huge player in the development of Elizabeth’s business, Watercolor & Ink, as it provided her a place to offer not only current work but also contract out unique and custom designs to clients throughout the country. 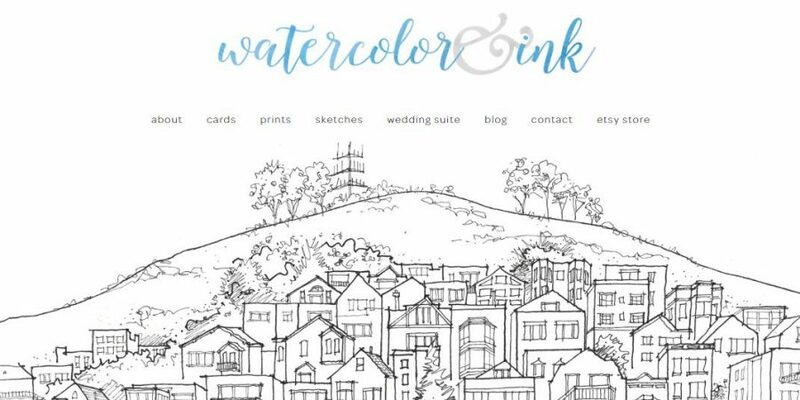 It has been three years since Elizabeth launched Watercolor & Ink, and she has learned a great deal about herself and her business. Her best tips and advice for the aspiring creative entrepreneur? The internet is your friend. There are so many resources available online to hone in on your trade. Elizabeth found YouTube to be hugely helpful in discovering free training. Practice makes perfect. Elizabeth stresses that you really need to practice. Nobody is perfect and we all need time to learn, digest, and try new techniques. Seek new creative outlets and make it fun for yourself. Don’t take life too seriously and remember to always enjoy your passion. Set small goals. Making realistic goals and deadlines for yourself is the key to staying grounded and keeping your creative juices flowing. Whatever you do, don’t force yourself into an unrealistic deadline. Play around with new ideas, tools, and techniques! It’s okay to mess around a bit with a variety of tools and learn from other creative minds. You don’t have to create something perfect on the first try, and you certainly won’t learn anything new without trying. Photoshop is a gift; use it. While this Adobe platform may seem daunting, it can help you easily manipulate design work without compromising the end product. For example, you may need to clean up a line, change a color scheme, or reuse a pattern you’ve drawn. Build your business online and in person. 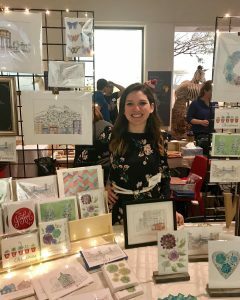 Elizabeth has focused her efforts on using Etsy, Facebook, and Instagram, but also believes it is important to attend trade shows and craft fairs to put a face to the business and make it more personal. For Elizabeth, Watercolor & Ink is a great outlet for creativity. She has learned that maintaining her love of drawing and watercolor doesn’t mean leaving behind a career. She has also been able to balance and enjoy a successful career, along with a well-run business and personal life, with help from great friends and a solid network of businesses. Artsy Couture is proud to be a strong supporter of Elizabeth Melara and we’re excited to be launching into an amazing partnership this Holiday season. 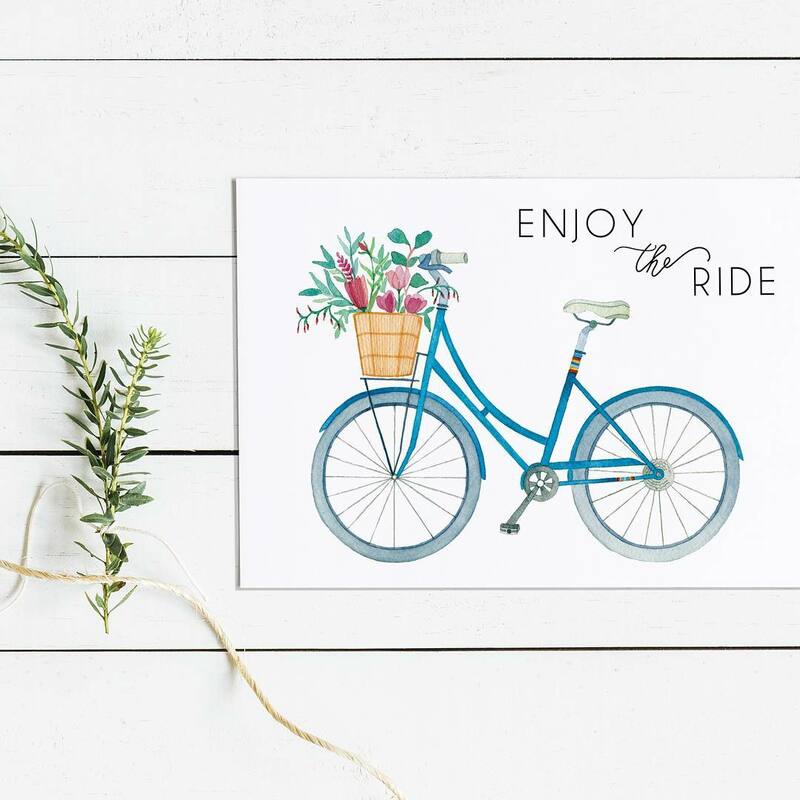 Keep an eye out for Elizabeth’s line of custom watercolor Holiday Cards, arriving in the next month! Did you enjoy this article on our September Fearless Females Finalist? Here are a few others you may like to read!